The Icom IC-V86-12 offers rugged, basic 2 meter performance in a rock solid package. You can select 7, 5.5, 2.5 or 0.5 watts of RF output. Extended receive is 136 to 174 MHz. Enjoy built-in CTCSS/DTCS Encode and Decode. 207 memory channels are featured including 6 scan edge and 1 call. And each memory can be labeled with up to 5 characters. Multiple scan types are available. The easy-to-use controls are very intuitive. 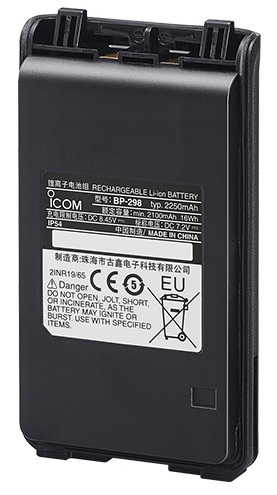 The Icom IC-V86 comes with: BC-242-A AC adapter, BC-240 fast Li-ion desk charge cradle, BP-298 Li-ion Battery (7.4 VDC 2250 mAh), belt clip, BNC flexible antenna and basic printed Owner's Manual. This quality HT is made in Japan. This model is now available. #4955 CS-V86 PC memory cloning software CD (requires OPC-478UC not included).